Welcome to our Ischia blog, Good Morning Ischia! Here you can see the entry for Thursday 16th January 2014. Another day springs to life in Ischia, the local roosters have already done their alarm calls, the early morning church bells have rung out and the birds have finished their little post-breakfast sing-song. The local cats are ambling around the garden looking for something to do, the younger ones playfully attacking each other as well as anything else that's smaller than them and has a pulse, while the oldest of them all simply stares vacantly into space philosophising over his next move before deciding a quick under-arm lick has the biggest priority. Up above the skies are mostly clear, the endless blue disturbed only slightly by a few scattered clouds that define the word "wispy". The towering Mount Epomeo is temporarily holding back the sun but as soon as it has scaled the 788 metre summit, the full power of its rays will be unleashed on Forio. Winds are very light, making for a sedate sea which will please almost everybody apart from those occasional windsurfers and para-gliders who wake every morning hoping to see rustling flags on top of the hotels or at least a cappuccino-like froth settling on top of the waves. Today's top temperature should again be around 14° Celcius (57° fahrenheit) but we'll be dropping down to single figures this evening with a low of 7°C (45°F), meaning a rare outing for the central heating. Conditions look very similar until Sunday when the weather charts are being darkened by images of thunder and lightning but let's hope that doesn't materialise. 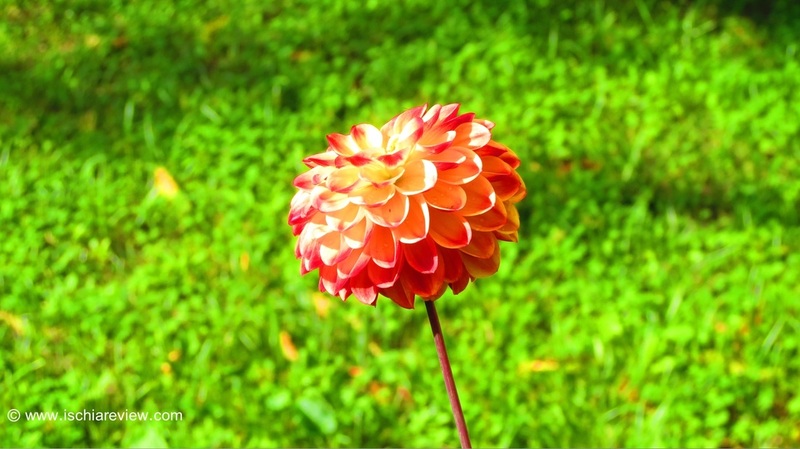 Today's photo is of the beautiful Dahlia that's still going strong in the garden. We bought this fantastic specimen as a few bulbs just under a year ago and it grew to around 4 feet and produced several new heads of bright orange and yellow flowers every day. It should be about to start withering some time soon as the coldest part of winter approaches but hasn't stopped giving for more than 6 months now. Next month we'll plant lots of new Dahlia bulbs in place of the shrubs that just didn't work out last year such as an azalea and a hydrangea that suffered from shock as soon as they were transferred from pot to ground. Having spent lots of money on shrubs last year we gradually realised that you get better results and money saved by simply creating what they call a "talea" in Italian, basically a "cutting" in English. We've got several hibiscus cuttings that have been growing in pots by the window that we'll plant around March time, while we've got lots of different-coloured rose stems that we just keep in water for around 6 weeks before they start to produce new roots, allowing us to eventually plant them in the spring. With almost a year under our belts of Ischia gardening we've learned a lot and hopefully that knowledge will be reflected in a spectacular garden full of a palette of colour once the spring and summer come. Apart from the colour that the flowers will provide there are the beautiful aromas to look forward to, there are strongly scented roses throughout the garden but the biggest impact is made by the jasmine bushes that are full of flowers at the end of March/beginning of April and we currently have one trained around the doorway which will be a wonderful greeting to any visitor as they step towards the house. In late summer the even stronger smell of the night-blooming jasmine fills the evening air with a sweet, intoxicating scent that lasts well into November. The smell is so strong that in some countries it's actually banned as some people are allergic to it but luckily we've had no complaints so far! As the flowers and the garden progress we'll take regular photos and keep you up to date with progress, as you can probably tell we're still very much novices in the art of horticulture so I'm sure we'll make a few mistakes along the way. If there are any experts out there by all means feel free to write in with any tips and suggestions that you think might help and we'll be very grateful for the advice. Ok that's all from me today, I'll be back with more tomorrow morning. Have a great day wherever you are.